a Hinsdale Orthopaedics, Hinsdale, Illinois, U.S.A.
b University of Rochester, Rochester, New York, U.S.A.
c The Steadman Clinic, Vail, Colorado, U.S.A. The purpose of this systematic review was to critically evaluate the available literature exploring the role of the hip joint capsule in the normal state (stable) and pathologic states (instability or stiffness). Furthermore, we examined the various ways that arthroscopic hip surgeons address the capsule intraoperatively: (1) capsulotomy or capsulectomy without closure, (2) capsulotomy with closure, and (3) capsular plication. Two independent reviewers (B.D.G. and B.G.D.) performed a systematic review of the literature using PubMed and the reference lists of related articles by means of defined search terms. Relevant studies were included if these criteria were met: (1) written in English, (2) Levels of Evidence I to V, (3) focus on capsule and its role in hip stability, and (4) human studies and reviews. Articles were excluded if they evaluated (1) total hip arthroplasty constructs using bony procedures or prosthetic revision, (2) developmental dysplasia of the hip where reorientation osteotomies were used, (3) syndromic instability, and (4) traumatic instability with associated bony injury. By use of the search method described, 5,085 publications were reviewed, of which 47 met appropriate criteria for inclusion in this review. Within this selection group, there were multiple publications that specifically addressed more than 1 of the inclusion criteria. Relevant literature was organized into the following areas: (1) capsular anatomy, biomechanics, and physiology; (2) the role of the capsule in total hip arthroplasty stability; (3) the role of the capsule in native hip stability; and (4) atraumatic instability and capsulorrhaphy. As the capsuloligamentous stabilizers of the hip continue to be studied, and their role defined, arthroscopic hip surgeons should become facile with arthroscopic repair or plication techniques to restore proper capsular integrity and tension when indicated. Instability has been recognized as a pathologic condition that can affect the function of the hip in a number of ways.5, 6 and 9 The continuum of hip instability is typically categorized into traumatic or atraumatic etiologies based on mechanism and clinical presentation.6 Traumatic hip instability is usually associated with a distinct event such as high-energy dislocation, with or without concomitant bony injury. However, lower-energy injuries may also result in a subtle traumatic subluxation episode that is less obvious. Atraumatic instability of the hip is a poorly recognized clinical entity that is emerging in the orthopaedic literature as a significant cause of functional impairment in the young patient.5 and 6 In the senior author’s series on revision hip arthroscopy, 35% of patients were found to have undiagnosed atraumatic instability.10 Usually, this occurs as the result of repetitive motion patterns that lead to microinstability, and it can ultimately result in progressive labral and chondral injury. The purpose of this study was to critically evaluate the existing evidence in support of (1) capsulotomy or capsulectomy without closure, (2) capsulotomy with closure, and (3) capsular plication. In addition, literature on the role of the capsule in stability versus stiffness is reviewed. Two independent reviewers (B.D.G. and B.G.D.) performed an exhaustive search of PubMed for articles that contained at least 1 of the following search terms: hip capsule, hip capsular, hip instability, hip stability, hip plication, hip capsulorrhaphy, atraumatic hip instability, hip capsulectomy, and hip capsule repair. The search included articles published from January 1930 to October 2011. In addition, reference lists from the relevant articles were retrieved to identify any additional studies of interest. Full publications were obtained for relevant studies that had potential to meet our inclusion criteria: (1) written in English, (2) Levels of Evidence I to V, (3) focus on capsule and its role in hip stability, and (4) human studies and reviews. Articles were excluded if they evaluated stability in total hip arthroplasty (THA) constructs that emphasized bony procedures or prosthetic revision, developmental dysplasia of the hip where reorientation osteotomies were used, or syndromic instability (e.g., Down syndrome, arthrogryposis, or neuromuscular) or if they reported on traumatic instability where there were associated bony abnormalities requiring treatment. By use of the search method described, 5,085 publications were reviewed by B.D.G. and B.G.D. Forty-seven articles ultimately met appropriate criteria for inclusion in this review. Within this selection group, there were multiple publications that specifically addressed more than 1 of the inclusion criteria. This is reflected in the breakdown of literature by topic and overlapping inclusion of relevant articles. Ten articles in this review directly addressed the biomechanical importance of the hip capsule.2, 3, 4, 8, 20, 32, 33, 34, 35 and 36 Ten relevant studies discussed the critical role of the hip capsule in maintaining total hip construct stability.4, 37, 38, 39, 40, 41, 42, 43, 44 and 45 Seven publications emphasized the role of the native hip capsule in hip stability.3, 9, 18, 25, 26, 27 and 46 Six articles addressed capsulotomy/capsulectomy as a viable treatment option for hip joint stiffness.19, 20, 21, 22, 23 and 24 Three contemporary reviews have advocated and described various technical approaches for capsular repair after arthroscopic instability or FAI surgery.9, 18 and 46 In our search we uncovered 8 review publications that mentioned arthroscopic thermal capsulorrhaphy.5, 6, 9, 28, 30, 31, 47 and 48 The same 8 articles also mentioned arthroscopic suture capsulorrhaphy as an established method to treat hip instability. There were 12 total clinical reports that discussed the use of arthroscopic or open capsulorrhaphy (thermal or suture) to treat hip instability.6, 10, 49, 50, 51, 52, 53, 54, 55, 56, 57 and 58 These were all case reports or small case series. Although the hip is an inherently stable joint by virtue of its bony geometry, static and dynamic soft-tissue stabilizers play a considerable role in maintaining joint congruity throughout a physiological and supraphysiological range of motion. The anatomy, function, and physiology of the fibrous hip capsule have been extensively studied.2, 3, 6, 8, 9, 20, 33, 34, 35, 64, 65, 66 and 67Table 1 further describes the various contributions of the capsuloligamentous stabilizers. Telleria and colleagues35 recently published a comprehensive arthroscopic description of the capsuloligamentous structures that is of particular relevance to the hip arthroscopist. They showed that these structures could be consistently identified using specific anatomic landmarks within the central and peripheral compartments of the hip. ER, external rotation; FH, femoral head; FN, femoral neck; IR, internal rotation. Because of their spiral configuration, the leash-like fibers of the zona orbicularis and anterior capsular ligaments tighten in a screw-home mechanism during terminal extension and external rotation, further stabilizing the joint.6 As the hip moves into flexion, the fibers unwind and loosen, rendering the joint less stable. The screw-home mechanism of the hip joint capsule may, in fact, represent an evolutionary adaptation that occurred as humans transitioned from quadrupeds to bipeds.66 and 67 Anthropologic literature supports the contention that as humans began to walk upright, the hips were brought into relative extension, thus causing the capsular fibers to twist into a spiral pattern. 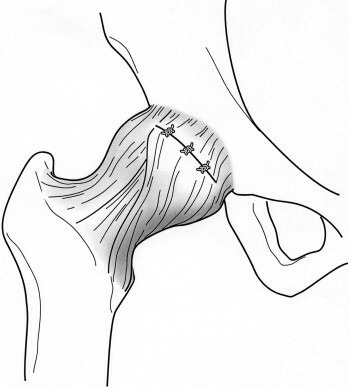 The hip joint capsule has been shown to significantly impact total hip construct stability in both biomechanical and clinical trials.4, 37, 38, 39, 40, 41 and 42 Capsular integrity in THA con-structs may serve as a proxy for native hip states, and meaningful conclusions can be extracted from careful review of these data. Elkins et al.4 studied the relative contribution of the hip capsule in THA stability and found that reducing the capsule to a thinner size, or creating capsular attachment defects, substantially compromised construct stability. However, they showed that even in the worst scenario of structural compromise, suture repair returned stability to within approximately 10% of baseline levels. Although studies on THA construct stability support routine capsular repair, less attention has been paid to the role of the capsule in arthroscopic hip surgery. The senior author and his colleagues recently studied the relative contributions of the acetabular labrum and iliofemoral ligament in hip stability.3 They used a cadaveric model that simulated typical capsulotomy incisions used during hip arthroscopy. They found that external rotation and anterior translation were both significantly increased when the iliofemoral ligament alone was sectioned and were further increased when both the labrum and iliofemoral ligament were sectioned in concert. Interestingly, repair of the labrum alone did not result in normalization of external rotation or anterior translation, but repair of the labrum in conjunction with repair of the iliofemoral ligament adequately restored these parameters to the native intact state. These findings underscore the notion that careful attention to the capsule is necessary when addressing symptomatic labral tears or regions of bony impingement arthroscopically. In addition, these findings seem to suggest that gaining access to areas of chondrolabral pathology or zones of cam deformity through large capsulotomies may result in a significant degree of supraphysiological motion, thus minimizing the biomechanical advantage of performing arthroscopic labral repair. In cases where there is concern for subtle capsular laxity or in athletic individuals without preoperative stiffness, capsular closure has the potential to reduce postoperative microinstability and accelerate recovery. It is important to recognize, however, that “capsular repair” may indicate different things for different surgeons. Some create a T-shaped capsulotomy through the zona orbicularis to improve visualization in the peripheral compartment. At the conclusion of the case, some surgeons close the longitudinal part of the T-capsulotomy using a suture shuttling technique while leaving the transverse part open.18 Other techniques avoid transection of the zone orbicularis altogether and use similar shuttling techniques to repair the portal-to-portal crescent-shaped capsulotomy.9 Our preferred technique for routine capsular closure is described later (Fig 1, Fig 2, Fig 3, Fig 4 and Fig 5, Video 1, available at www.arthroscopyjournal.org). To our knowledge, there has only been 1 reported clinical case of a capsular repair in a native hip: Matsuda26 performed an open direct side-to-side suture repair of the anterior capsule on a patient who sustained an acute iatrogenic dislocation after hip arthroscopy. A summary of the evidence for and against routine capsular closure is included in Table 2. Fig 1. Routine anterosuperior capsulotomy (12 to 3 o’clock) in a right hip for central and peripheral compartment access during hip arthroscopy. Fig 2. Anterior view of a right hip after routine anterosuperior capsulotomy (12 to 3 o’clock). The arrows denote respective proximal and distal capsuloligamentous flaps for later repair or plication. Fig 3. Typical configuration after arthroscopic sutures have been passed in side-to-side fashion between the proximal-to-distal limbs of the respective capsuloligamentous flaps during routine capsular closure. Fig 4. The final repair construct after direct side-to-side capsular closure as viewed from anterior to posterior on a right hip. Fig 5. The concept of a direct side-to-side capsular repair (arrows) without an inferior shift or capsulorrhaphy. Routine repair/closure in all patients may result in a higher incidence of postoperative stiffness. Four cases of iatrogenic hip dislocation/subluxation after excessive anterior/lateral rim resection, after bony dysplasia, or in setting of capsular laxity and atraumatic instability have been reported.25, 26, 27 and 70 Postoperative subluxation characterized by an inability to maintain a concentric joint is likely under-reported. Whereas making the diagnosis of atraumatic hip instability is challenging in its own right, treatment of the underlying pathophysiological process is even more challenging. Patients with atraumatic hip instability often exhibit a spectrum of subtle morphologic abnormalities or patterns of connective tissue dysfunction or may even have underlying systemic conditions. Once the diagnosis is suspected clinically and conservative measures have failed, intraoperative findings are useful to confirm the diagnosis. The joint may distract easily, and greater displacement of the femoral head from the acetabulum may be seen. Arthroscopic visualization may show overt laxity or thinning of the capsule. Furthermore, indirect signs of atraumatic instability, such as ligamentum teres tears, are demonstrable intraoperatively. Domb and colleagues73 defined a “stability index” and found that ligamentum tears are more common in hips with a lower lateral center-edge angle and higher inclination, as well as in hips without acetabular retroversion. The use of open suture capsulorrhaphy for recurrent anterior and posterior hip instability has been reported for decades.6, 49, 50, 51, 52, 54, 55, 56 and 57 Recent technical advances, coupled with an improved understanding of atraumatic hip instability, have allowed the arthroscopic hip surgeon to address some of the contributing soft-tissue influences on this disease spectrum in a much less invasive manner. Arthroscopic capsular tightening may be achieved in a number of ways5, 6, 9, 10, 25, 28, 29, 31, 47, 49, 50, 51, 52, 53, 54, 55, 56 and 57 and can be performed in isolation or in conjunction with other necessary intra-articular work. Our preferred technique is discussed later. The setting of hyperlaxity with concomitant intra-articular pathology presents a challenging dilemma to the arthroscopic hip surgeon. When strategic anterosuperior capsulotomy is necessary to facilitate instrument passage and implant placement, suture capsulorrhaphy remains the only major treatment option present in the literature. Techniques to address combined chondral-labral injuries or FAI and capsular laxity have been described.9, 28 and 31 Arthroscopic suture plication or capsulorrhaphy, though technically demanding, has achieved consistent success in small case series and reports.10, 25, 28, 29, 31 and 53 Most technical descriptions recommend that a variable number of sutures should be shuttled with a hooked suture shuttling device and then retrieved with a soft-tissue penetrator. Tension of the plication can be controlled by altering the size of the “bite” incorporated or by penetrating more distally into the capsular expansion at the zona orbicularis when retrieving the passed suture. An inferior shift can also be achieved by carefully modifying the location of tissue gathered in the plication construct. Because the anterior capsuloligamentous complex normally tightens in extension, an inferior shift may potentiate the screw-home mechanism and enhance dynamic tension in this position. Our preferred technique to achieve an inferior capsular shift is described in further detail later. Techniques for posterior and posterosuperior capsular plication have also been described.6 The application of arthroscopic capsular plication has even been expanded to use in well-positioned unstable THA.53 Factors impacting the decision whether to leave the capsulotomy open or perform capsular repair plication are listed in Table 3. At the conclusion of the intra-articular procedures, closure of the capsulotomy is performed (Fig 2, Fig 3, Fig 4 and Fig 5, Video 1). 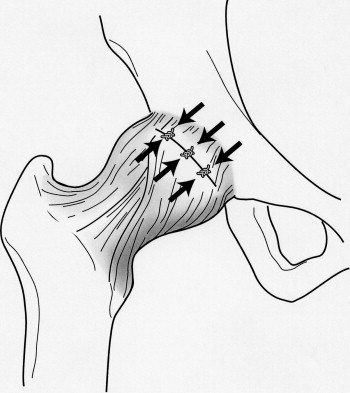 With the hip in 45° of flexion, a disposable cannula (Arthrex, Naples, FL) is introduced through the midanterior portal. A crescent penetrator (Arthrex) is used to pass a suture lasso through the capsule on the proximal side of the capsulotomy. The bird-beak penetrator is then used to retrieve the lasso through the capsule on the distal side of the capsulotomy near the zona orbicularis (Fig 3). The lasso is used to pass a permanent or absorbable suture, achieving a side-to-side stitch (Fig 4 and Fig 5). This is tied arthroscopically with the knot outside of the capsule. A total of between 2 and 4 side-to-side stitches may be placed to complete the capsular closure. The hip is then brought into extension while the surgeon is watching the capsular closure arthroscopically, to ensure that the capsule has not been overtightened. Some technical pearls for routine capsular closure are listed in Table 4. Adequate capsular tissue from the proximal origin adjacent to the acetabulum should be retained. Overzealous ablation or resection may compromise any viable tissue available for later repair or result in an overtensioned repair construct. Use of a suture lasso with a “wheeled” delivery system can optimize delivery for subsequent retrieval without inadvertent suture lasso removal. If side-to-side closure is not possible and instability is a concern, a more proximal row of suture anchors can be placed along the rim of the acetabulum and subsequently retrieved from under the distal limb of the capsule and tied in extracapsular fashion. Frequent dynamic examination can aid in the determination/assessment of adequate tension. Sutures should always be tied with the joint in a reduced position. A cannula should be placed just outside the capsule to prevent a “soft-tissue bridge” when performing blind arthroscopic knot tying. Capsulotomy is performed as just described, followed by diagnostic hip arthroscopy and procedures as indicated for treatment of labral tears, FAI, or other intra-articular pathology. 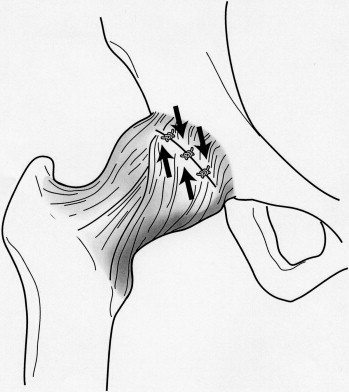 At the conclusion of all intra-articular procedures, capsular plication is performed with the hip in 45° of flexion (Fig 6, Fig 7 and Fig 8, Video 1). Side-to-side stitches are passed by use of the technique for suture passage described earlier for capsular closure. However, the sutures are passed in such a fashion that larger bites of the capsule on the distal side are taken, passing the suture through the zona orbicularis itself. Taking larger bites leads to imbrication of the capsule, increasing the tightness of the capsule in external rotation (Fig 6 and Fig 7). In addition, the location of suture passage through the zona orbicularis is more medial than the corresponding point of passage of the same suture on the proximal side of the capsule (Fig 6 and Fig 7). When the sutures are tied outside of the capsule, this results in an inferior shift. 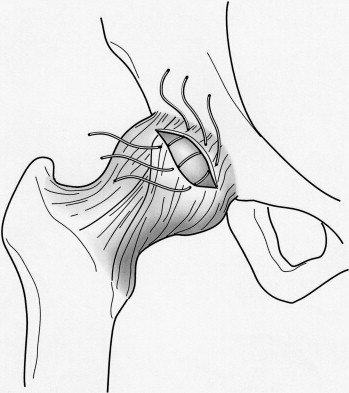 The inferior shift augments the screw-home mechanism of the hip by accentuating the spiral orientation of the capsular fibers (Fig 8). This increases the degree to which the capsule tightens in extension. A total of between 2 and 5 stitches are used. The hip is then brought into extension while the surgeon is watching the capsular closure arthroscopically, to ensure that the capsule has not been overtightened. The combination of imbrication and inferior shift increases the tightness of the capsule in both external rotation and extension and thus diminishes potential anterior instability in that position. Fig 8. Final capsular plication illustrating re-creation of the natural screw-home mechanism of the native hip capsule. An exhaustive review of the available literature on the hip joint capsule was carried out to better understand the role of the capsule in maintaining hip joint stability. Our analysis supports the contention that indiscriminate capsulotomy can compromise hip stability but may be beneficial in stiff hip conditions. Biomechanical data strongly favor maintaining or restoring the capsule to an intact state whenever possible to normalize kinematics and reduce the risk of idiopathic instability. Furthermore, clinical data from the hip arthroplasty literature reinforce the importance of capsular repair to maintain postoperative joint construct stability. Although short-term and midterm outcome studies report an overall high rate of success after hip arthroscopy, there remains a considerable subset of patients who do not benefit from surgery or who require early conversion to THA. It is conceivable that a more dedicated approach to maintaining capsular integrity will result in improved outcomes and an even higher long-term success rate. Therefore it is prudent for the arthroscopic hip surgeon to consider routine repair of the capsule (or at least a portion of the capsule) in all cases where stiffness is not a predominant feature. In appropriate circumstances where atraumatic instability or excess capsular laxity is suspected, capsular plication or capsulorrhaphy should be considered. Although the available clinical data on hip capsulorrhaphy are lacking, early and midterm outcomes of open or arthroscopic techniques remain favorable. Whereas arthroscopic cap-sular closure or plication techniques remain technically challenging, it is important that the arthroscopic hip surgeon become facile with these techniques as data supporting the critical role of the capsule continue to emerge. Biomechanical and clinical studies have consistently shown that the hip joint capsule plays an important role in maintaining stability of the hip joint. Attenuation of the capsule from traumatic, atraumatic, or iatrogenic etiologies may lead to microinstability or macroinstability of the joint. Arthroscopic hip surgeons have traditionally used an unrepaired capsulotomy or capsulectomy with favorable clinical outcomes and without appreciable sequelae. Although in some cases strategic capsulotomy or focal capsulectomy may be therapeutic, injudicious capsulotomy should be avoided at all costs. Furthermore, as the role of the capsule continues to be studied and defined, arthroscopic hip surgeons should become facile with arthroscopic repair or plication techniques to restore proper capsular integrity and tension when indicated. W. Köhnlein, R. Ganz, F.M. Impellizzeri et al. M.R. Torry, M.L. Schenker, H.D. Martin et al. C.A. Myers, B.C. Register, P. Lertwanich et al. J.M. Elkins, N.J. Stroud, M.J. Rudert et al. R.E. Boykin, A.W. Anz, B.D. Bushnell et al. M.J. Philippon, M.L. Schenker, K.K. Briggs et al. R. Ganz, T.J. Gill, E. Gautier et al. M.J. Philippon, A.J. Stubbs, M.L. Schenker et al. J. Hewitt, F. Guilak, R. Glisson et al. W.M. Goldstein, T.F. Gleason, M. Kopplin et al. M.K. Shindle, J.E. Voos, S.J. Nho et al. J.R. Lieberman, D.W. Altchek, E.A. Salvati et al. C.J. Dy, M.T. Thompson, M.T. Crawford et al. B.G. Souza, W.S. Dani, E.K. Honda et al. Do complications in hip arthroscopy change with experience? Relationship between tears of the ligamentum teres and acetabular undercoverage: Does microinstability play a role? B.T. Kelly, A.S. Turner, M. Bansal et al. The authors report the following potential conflict of interest or source of funding in relation to this article: Smith & Nephew. Address correspondence to Benjamin G. Domb, M.D., Hinsdale Orthopaedics, 550 W Ogden Ave, Hinsdale, IL 60521, U.S.A.